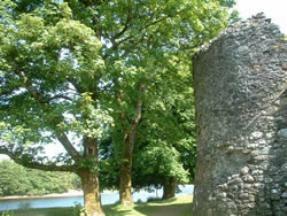 When visiting the Fort William area do stop off to look around Old Inverlochy Castle. 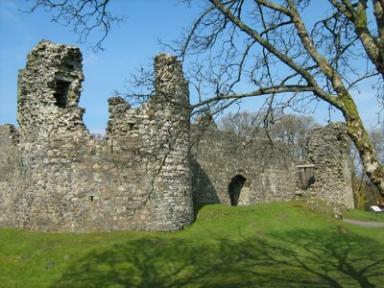 Although now a ruin this was one of the most important castles in Scottish history and has been the backdrop for two major historical events, the first and second battles of Inverlochy. The moat that surrounded the castle has long gone but the natural defensive postion against the River Lochy gave Inverlochy castle a superior advantage. The old Military Road passed right by the castle and can still be followed back in to Fort William. Originally dating back to the 13th century, Inverlochy Castle last played a part in Scottish and English history during the Civil Wars of the 1640's. In 1645 the royalist Earl of Montrose routed the roundhead forces of the Campbell Chief Duke of Argyll at the second Battle of Inverlochy. In 1654 the Castle was "replaced" by a large timber fort built by Oliver Cromwell which in 1690 was then replaced by a stone fort named Fort William after King William III. The town which grew around it was named Maryburgh after the Queen, Mary II, though eventually it took the same name as the fort. In 1836 a new Victorian, chateau-style Inverlochy Castle was built in nearby Torlundy. This has since been converted into a luxury hotel. The "Fort" in Fort William was fell into disuse by the mid 1860's when the railway was built to Fort William, cutting though the land on which the Fort was built along the side of Loch Linnhe. However, some parts of the ruins still remain by the side of the Loch, at the end of the by-pass before the College and supermarket at the end of the road. If you decide to walk from Chase The Wild Goose Hostel at Banavie by road into Fort William it's worth taking a detour to view this castle, located just off the A82 road, and signed.